Fox’s Proven Innocent has become my must see Friday night television viewing. The scripts are compelling and the acting powerful. The cases presented in the episodes have touched on important and headline issues such as Islamaphobia and white supremacy and the bias and discrimination those wrongly convicted often face from the justice system. It tells the story of Madeline Scott who along with her brother Levi were wrongly convicted of the murder of friend Rosemary Lynch. Levi and Madeline spent ten years in prison. Once freed, Madeline formed a law office with Ezekiel “Easy” Boudreau, the attorney who helped get her off. Now she’s on a quest to help other wrongly convicted individuals. The premise of this show is great and the cast is on point with each of the actors portraying their characters in a relatable way. Viewers must believe the motivation of the characters in order for the story not to feel wooden. In watching the Injustice Defense Group, I know they are focused on their mission of ensuring justice and will do whatever is necessary to obtain it for their clients. If I have one compliant about Proven Innocent, it’s the lack of Young Madeline in the episodes. I know the focus of the story has to be the case of the week and the team’s endeavors in gathering the truth. But Young Madeline’s scenes in the episodes are little more than cameos. Adult Madeline (Rachelle Lefevre) will see a similarity between her case and her client’s and be reminded of her experience. And viewers will get a flashback glimpse. In the recent episode “Living and Dying in East Cleveland,” there was no appearance by Young Madeline as the episode showed Madeline’s first meeting with Easy with Lefevre in the prison scenes. I want to see more of Young Madeline as I feel it’s important to show how prison contributed to the woman she became. As Gore Bellows (Kelsey Grammer) and Isabel Sanchez (Catherine Lindstone) plot to get the Scotts retried for Rosemary’s murder, maybe we’ll get an episode where more facts of the case will come to light with scenes featuring Clare O’ Connor. I’ve been interesting in seeing Madeline’s journey from prison to present day since the pilot episode. 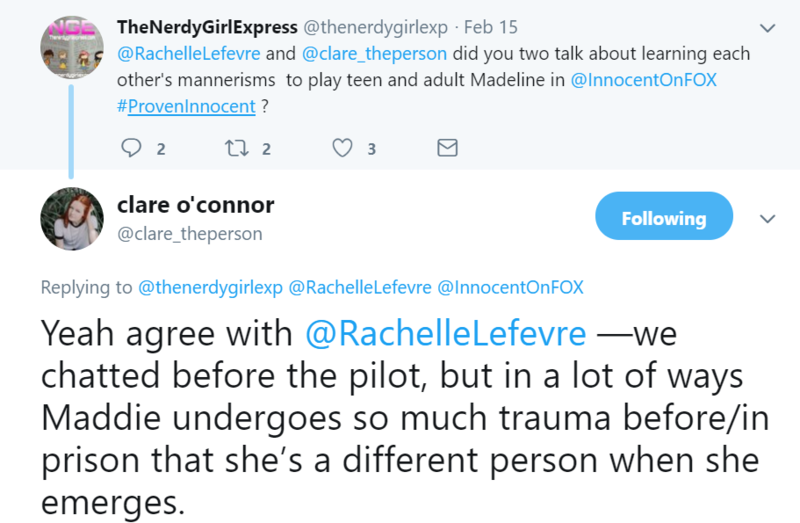 From what I’ve seen of Clare O’ Connor’s performance as Young Madeline, there’s more to tell and I hope Proven Innocent will give viewers this opportunity. Madeline is the main protagonist in Proven Innocent. Who she was. Who she became. And how she grew and changed along the way.